A controversy raging for two decades over the causes of the worldwide pandemic of autism in children was resolved unequivocally in formal evidence by Francis S. Collins, M.D., Ph.D. in 2006 but little notice was taken then. Today Collins controls the US’ annual medical research budget of US$30.5 billion: [NIH Budget] making Collins’ 2006 evidence of substantial international significance for many millions of parents and their children and for funding of research into the causes of autism. The drug industry, medical experts, World Health Organisation and government health officials worldwide have systematically represented autism spectrum conditions as solely genetically caused whilst denying any role of childhood vaccines or other factors like environmental toxins. Independent scientists, medical experts and parents contradict this and say there is good evidence autism is caused by vaccines and environmental toxins like mercury. Collins as a leading medical doctor and geneticist who led the Human Genome Project confirmed in public to the US House of Representatives in May 2006 that recent increases in chronic diseases like diabetes, childhood asthma, obesity or autism must have an environmental [external] cause and cannot be solely genetically [internally] caused conditions: [full quote & weblink below]. The NIH makes almost 50,000 competitive grants to more than 325,000 researchers at over 3,000 universities, medical schools, and other research institutions in every US state and around the world. About 10% of the NIH’s budget supports projects conducted by nearly 6,000 scientists in its own laboratories, most of which are on the NIH campus in Bethesda, Maryland. Collins was appointed and sworn in as the 16th Director of the US National Institutes of Health on 17th August 2009 after nomination by President Obama: NIH News Release 17th August 2009. But will Collins’ appointment make any difference to the present research position? Will the influence of the pharmaceutical industry and financial conflicts of some in the medical professions prevent much needed research being carried out? The position does not look too good as reported by award winning journalist David Kirby: [NIH Agency Head Backs Vaccine-Autism Research on Friday; Resigns from Federal Autism Panel on Saturday Huffington Post 20th October 2009]. Story Landis, PhD, director of the National Institute of Neurodevelopmental Disorders and Stroke (NINDS), an NIH agency, surprised many parents on Friday by stating that autism researchers should study “the children who have been most profoundly affected” by adverse reactions to vaccination. On Saturday, Dr. Landis abruptly resigned from the powerful Interagency Autism Coordinating Committee (IACC), which helps direct hundreds of millions in federal tax dollars to autism research, treatment, care and services. The controversy over the environmental causes of autism has its foundations in the now clearly flawed work of English psychiatrist Professor Sir Michael Rutter. Our article of 25th January this year Autism Not Genetic – Says Expert Professor Simon Baron Cohen demonstrated the unscientific and flawed logic of Rutter’s original paper which has misled the world for so long: [“Infantile autism: A genetic study of 21 twin pairs.” J. Child Psychol. Psychiat. 18, 297-321 (1977)]. Here is the same data normalised by annual % of children receiving MMR vaccination – showing the same correspondence as above graph. . In other words, it is the 40% of identical twins where only one develops symptoms of autism which tells us autism is not “genetic“. In those cases it must have an environmental [external] cause. Professor Baron Cohen errs in assuming the 60% of both twins developing autism is evidence autism is ever a genetically “caused” condition. It is not such evidence. The correct medical terminology is whether a condition has an “internal” cause or an “external” one. Because the twins are genetically identical all we can say for those who both develop autism is their bodies have responded identically to the same set of conditions whether “internal” or “external”. It tells us nothing about whether the cause is internal or external [environmental]. It is neither scientific nor logical to assume the “cause” is internal or external [environmental]. It is wrong to do so and a logical fallacy. Where both identical twins develop autism, it is more likely than not they have had the same exposure to the same environmental cause. That is more likely than not to happen [60% of the time it seems]. For example, both twins are more likely than not to have their vaccinations at the same time and all other circumstances in their lives at that time are more likely than not to be identical for both. All human medical conditions whether “internal” or “external” are genetic. Some of us are more susceptible to’ flu than others and some never suffer from it. So it is also logically inappropriate to discuss causes of conditions in terms of being “genetic” because all human conditions are genetic whether the cause is “internal” or “external”. This also demonstrates why it is not wise to rely on medical doctors’ attempts to be scientific. The majority have no formal scientific training or qualifications and frequently make errors of the fundamental kind illustrated here. We only become ill or develop any condition because we are genetic. Everthing else breaks down. Computers, cars, washing machines and refrigerators breakdown whether for an “internal” cause or an “external” one – they do not and cannot get ‘flu, measles or autism because they are not genetic. If we were not genetic we would not get sick [but we might rust a bit from time-to-time]. 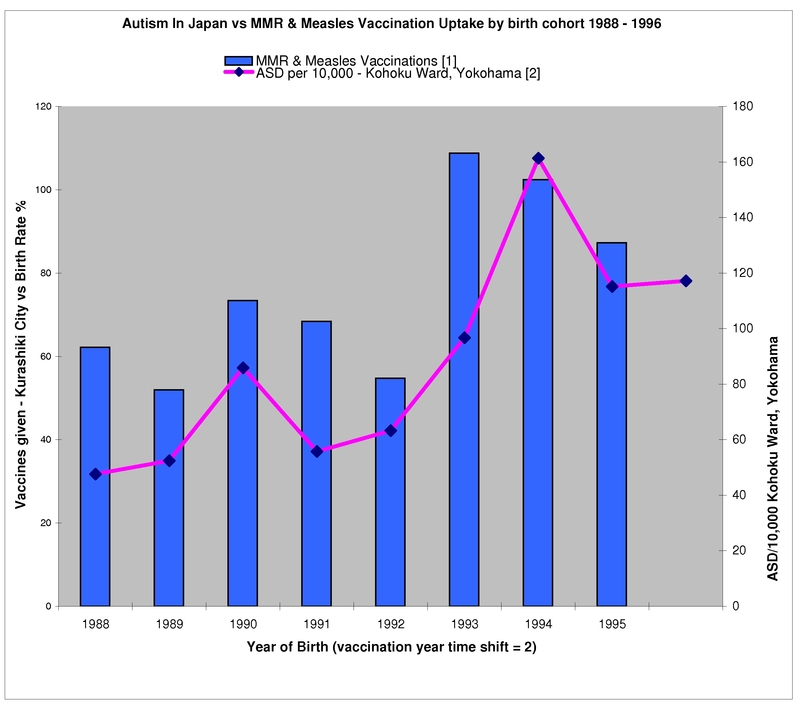 There appears to be no scientific evidence autism is any more “genetic” than ‘flu. Feel free to submit a comment if you disagree. To establish with scientific evidence that any condition has a solely genetic [internal] cause any more than any other illness or disorder requires evidence showing that in some cases there are no possible environmental causes. The environmental causes have to be eliminated by the collection of evidence in a scientific manner. This has not been done, as the reliance on the twin studies demonstrates. What we can conclude is that autism is an environmentally [externally] caused condition, with some more susceptible than others, like most other human medical conditions. Who Is Professor Sir Michael Rutter? Professor Sir Michael Rutter is Professor of Developmental Psychopathology at the Institute of Psychiatry, Kings College, London. He has been a consultant psychiatrist at the Maudsley Hospital since 1966, and was Professor of Child Psychiatry at the Institute of Psychiatry from 1973 to 1998. He set up the Medical Research Council Child Psychiatry Research Unit in 1984 and the Social, Genetic and Developmental Psychiatry Centre 10 years later, being honorary director of both until October 1998. His research has included the genetics of autism; the study of both school and family influences on children’s behaviour; the links between mental disorders in childhood and adult life; epidemiological approaches to test causal hypotheses; and gene-environment interplay. He was Deputy Chairman of the Wellcome Trust from 1999 to 2004, and has been a Trustee of the Nuffield Foundation since 1992. He was elected a Fellow of the Royal Society in 1987 and an honorary member of the British Academy in 2002. He was a Founding Fellow of the Academia Europaea and the Academy of Medical Sciences, of which he is currently Clinical Vice-President. He has received numerous international honours and has published some 40 books and over 400 scientific papers and chapters. Professor Sir Michael Rutter along with a troupe of psychiatrists now or formerly associated with The Maudsley Hospital and The Institute of Psychiatry at Kings College, London University, have been working hard at telling the public autism is solely genetic and denying there is a world autism pandemic. If a condition is genetic, you also do not suddenly get spontaneous mutation of large numbers of individuals. That suggestion is counter logical and non science. Genetics cannot account for the large rise we are seeing in autism since the mid 1980s. So instead what we see are efforts by Rutter and the King’s Institute of Psychiatry other autism denialists to claim there is no real rise in the prevalence of autism. This claim is unscientific and runs counter to the facts documented in the formal literature. BBC psychiatrist Tonmoy Sharma is struck off By Lucy Cockcroft The Telegraph 01 April /2008A psychiatrist who regularly appeared as an expert on the BBC has been struck off the medical register after he lied about his academic qualifications and performed unethical drugs tests on mentally ill patients. The Institute of Psychiatry has or is home to more than its fair share of doctors (psychiatrists mostly) who publish papers claiming autism is genetic and denying there is an autism epidemic (the correct word is pandemic – epidemics have far fewer victims). These doctors include Rutter, Eric Fombonne (now expert witness in the US in the thiomersal/autism litigation when he had previously published nothing about it) and Professor Simon Baron Cohen. It is also home to controversial “Gulf War Syndrome” psychiatrist Simon Wessley, director of the Centre for Military Health Research at King’s College London and who had been claiming ME/CFS is not a physical condition but a mental one contrary to the definition used around the world. Sophia Wilson is an example of an ME/CFS sufferer who died following this approach to diagnosis, albeit there is no evidence available to this author she was ever a patient of any of the psychiatrists or institutions name here. Also associated with The Institute of Psychiatry and the Maudsley is Dr Ben Goldacre, who constantly attacks alternative medicine in The Guardian [a UK national newspaper] whilst writing the “Badscience” column – yet Goldacre has no scientific qualifications and avoids disclosing that he practises psychiatry. Psychiatry is the least successful branch of medicine in history and is notorious for a lack of scientific bases to support the theories some of its proponents put out. Goldacre works with Wessley. Goldacre and Wessley have close professional and personal connections to King’s Mobile Phones Research Unit. Goldacre has made public attacks, backed by the industry funded lobby group, The Science Media Centre, on a BBC Panorama documentary about mobile phone hazards, which hazards were raised by the current head of the UK’s Health Protection Agency, before taking up that post. Ben Goldacre and The Science Media Centre attacked the programme and its journalists. Rutter was also an expert witness in Malmo, Sweden in an MMR autism case where the key question was whether autism was solely genetic and not environmental. Rutter’s expert evidence was that it was genetic [not possible – Autism Not Genetic – Says Expert Professor Simon Baron Cohen]. And this could go on and on and on …………………. When confronted with the above evidence on Rutter’s Japanese autism paper Charman refused to have the Honda/Rutter paper retracted or to publish a correction or rebuttal. The publishing group Blackwell which published the Honda/Rutter paper have provided no comment. In Whom Can You Trust? Thank you for your commentary regarding Dr. Collins and his approach to “autism”. Dr. Rutter was aware of an alternate understanding before he became wedded to a genetic etiology of “autism”. “At long last, there is reason to believe that some answers to these questions (about autism) seem to be around the corner. Biochemical explorations, pursued vigorously in the very recent past, may open a new vista about the fundamental nature of the autistic syndrome.” Kanner. L. (1971) Follow-up study of eleven autistic children originally reported in 1943. J Autism Child Schizophr 1,119-145. The promise of clarifying research revealing the biochemical nature of autism and its origin in physiological injury to the brain and other systems has never been realized in the almost 40 years since Kanner and Rutter made their observations. One thing is clear: that the evidence gathered then and since points not to a genetic cause for the disorder but to something else, most likely the biochemically based physiological injury to which both Kanner and Rutter pointed in 1971. One wonders what factors may have led researchers like Rutter and others off the track of their early focus on physiological and biochemical causes. Likely, those misdirecting factors had little to do with dispassionate investigation and a great deal to do with biases in the research establishment directed by commercial interests of the now fully emerged hegemony of the pharmaceutical industry. 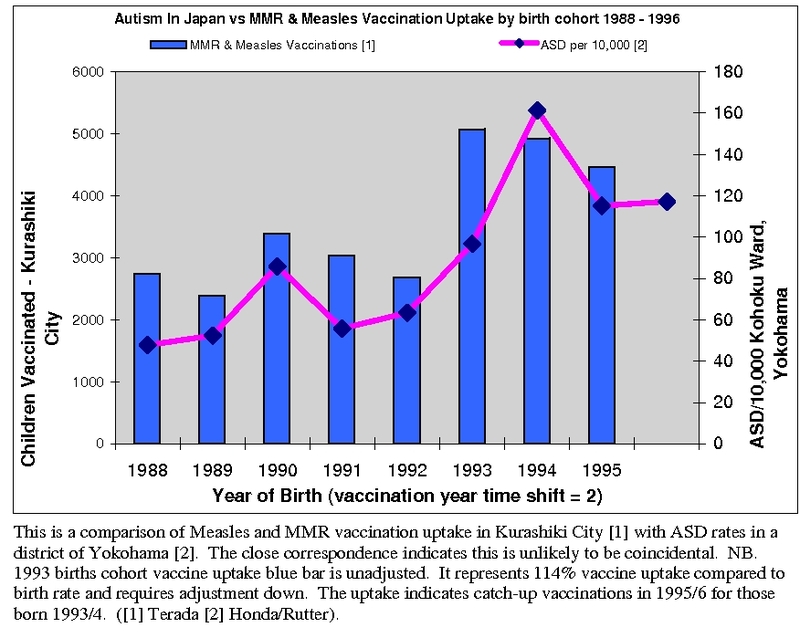 Also, this is the same Rutter who signed off on the flawed Honda/Rutter MMR study out of Japan, that chs reported on so valuably in June – showing graphically a dose response relationship between the MMR and autism. Why hasn’t more been made of this important finding? And why are ‘we’ still listening to Rutter? It surprises me that more attention hasn’t been given to infections bacterial and viral to the causes of Autism. about her research with XMRV retrovirus. Some study she did has found the presence of XMRV in Autistic children. During the TV interview she explains how the mechanism for vaccine and retrovirus work which can explain why so many autistic chidren were normal prior to a vaccine. Dr Bransfield a psychiatrist and other doctors have found a link between autism and lyme disease and on appropriate treatment the symptoms improve. They acknowedge the complex issues causing Autism not just one micro organism but also other factors including vaccines but at least they are looking at causes and having successes. I had the priviledge to hear Dr Bransfiedl present at the 2008 Lyme Disease Action conference about his work related to Lyme disease. That was how I became interested in the link with Autism. At present the IDSA discredited guidelines for lyme disease are being reviewed. Alternative guidelines ILADS say that Lyme is not rare, the blood tests are unreliable(50% according to some figures) and that for some patients long term antibiotics are necessary. Steven Phillips presentation at IDSA review hearing shows evidence of Seronegativity and Persistent infection. Details on IDSA website. Trolling and internet stalking by a clearly compulsive obsessive member of a forum whose members block discussion but some of whose members for sport in their spare time disrupt other fora on the internet and attack, bully, abuse and harass ordinary people and parents of very sick children wanting to share information. These kinds of groups are organised for just such a purpose on the internet. To quote Dr Ben Goldacre himself commenting on his own BadScience Forum: “The time for talking has passed. I draw the line at kidnapping, incidentally.“. This is on a site owned and operated by Dr Ben Goldacre as a high profile opinion former in the mainstream medical professions]. Just My opinion , but i suspect 2 forms of autism . Genetic autism and Bisphenol-A autism . The genetic autism/aspergers, have triglyceride issues and anomalies with their complex I and II of the electron transport chain among other metabolic/immune issues. Bisphenol-A autism have over-connected neurons(impaired neuronal pruning ) and chronically over-activated microglia, among other metabolic/immune issues. genetic asd has always been with us. the bisphenol-A asd began in earnest in the 1980s because BPA in everything esp eating and drinking utensils, shampoos, lotions, underarm deodorant etc. suspect agressive vaccine schedules make both worse because of TH2 shifting issues .